Christopher J. Jurgens is an Affiliated Researcher with the Texas Archeological Research Lab. An excerpt of this article appeared in the December 2017 TARL Newsletter. In 2014, Dr. Steve Black requested that I dust off my ‘research hat’ when I retired after a career in state government. As with my own academic beginnings, Steve was a product of the undergraduate Archaeological Studies program at UT-Austin in the 1970s. Dr. Black worked at the Texas Archeological Research Laboratory (TARL) after completing his Ph.D. at Harvard University before becoming a professor in the Anthropology Department at Texas State University. My doctoral research focused on the Lower Pecos cultural region of the Texas borderlands and was completed in 2005. TARL’s prolific and well-preserved collections from Arenosa Shelter (site 41VV99) formed the basis for my research (Jurgens 2005, 2008). Bone preservation in the region’s dry rockshelters is typically very good, especially for sites with cultural materials in Holocene-age contexts. Remember Ezekiel’s Biblical message about dry bones? 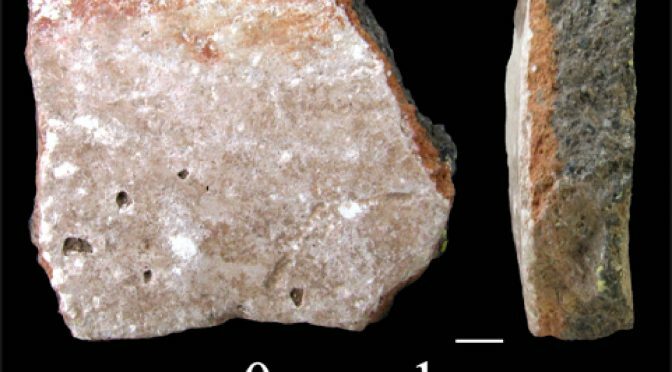 As an analogy to this prophet’s ancient words, bone fragments ‘come alive’ to help us understand the prehistoric cultures in this region and, increasingly, in other regions of Texas. Black’s “come visit” invitation came nearly a decade after completing my Ph.D. at UT-Austin. Dr. Black invited me to join his Ancient Southwest Texas (ASWT) project research team at Texas State University, adding my research specialties of zooarchaeology and bone technology to the team. Since then, I’ve also worked with the Center for Archaeological Studies (CAS) at Texas State University. At CAS, I am conducting similar research for a data recovery project at the Spring Lake site in San Marcos and smaller, historic period sites in San Antonio. Zooarchaeologists study animal (aka, faunal) remains from archaeological sites using a specifically anthropological standpoint instead of a biological or paleontological perspective (Reitz and Wing 2008). 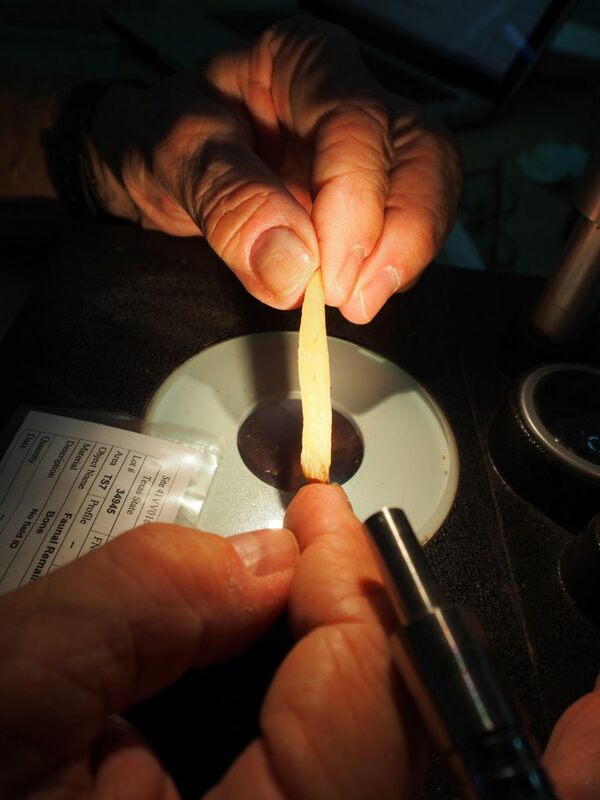 Zooarchaeological faunal studies are also used to investigate site formation, biological processes, and cultural processes that are reflected in the particular collection (or sites) being studied. The anthropological perspective addresses the complex interaction between humans, their environment, and the consequences of that relationship. Animal bone fragments are analyzed to identify the animals and eco-niches represented and any human modification from subsistence or bone technology activities. Analyses begin with sorting of bone fragments into groups, based on size of animal, skeletal element, signs of burning, or other obvious evidence of butchering, skinning, or technological modification (Figure 1). 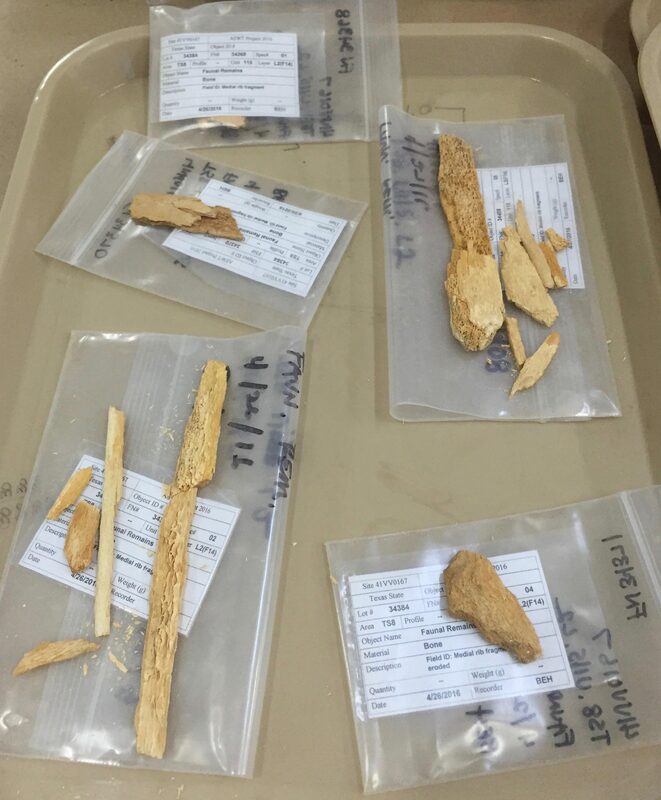 Figure 1: Bison bone fragments from Eagle Cave (41VV67, Feature 14 in basal deposits) near Langtry in the Lower Pecos region being sorted before consolidation and analysis. As a zooarchaeologist, an important question that I must answer during research is how faunal remains enter archaeological contexts. Are the faunal remains there strictly as a result of natural processes? Are the faunal remains spatially associated with cultural materials? Context of faunal remains is the key to understand their role in any site. If the faunal remains are spatially associated with cultural materials, then the zooarchaeologist must ask additional questions. Have the faunal remains been modified by cultural behaviors processes (skinning, butchering, tool manufacture or use, bone breakage for marrow removal or bone grease production, etc.)? If so, then the cultural filter has played a role in how the faunal materials were placed in the site. The bone fragments shown in Figure 1 are from an extinct bison recovered during 2016 excavations at Eagle Cave (41VV167) by Texas State University (Castañeda, et al. 2016). They reveal a late Paleoindian cultural filter through remnant evidence of intensive butchering. The bison’s mandible had many cut marks resulting from muscles being cut to allow the tongue to be removed (Figure 2). Ethnographic analogy from historic period bison hunters in the North American Great Plains mirrors this prehistoric evidence—the tongue was a prized portion of meat. For thorough discussion of this topic and related literature, see Jurgens (2005, Chapter 3). 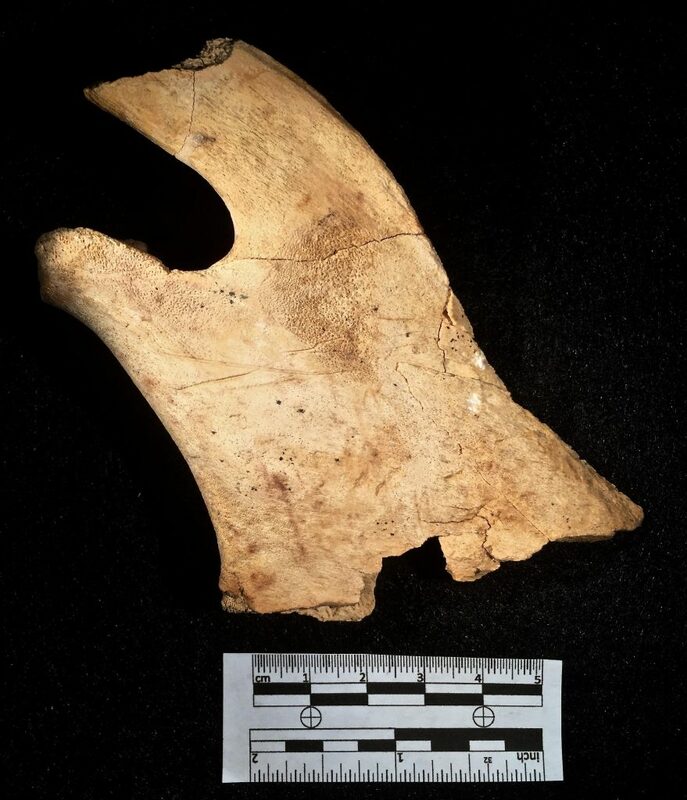 Figure 2: Right mandible fragment from intensively butchered extinct bison recovered during 2016 excavations at Eagle Cave (41VV167). One reason zooarchaeological studies are important in archaeological projects is that they help us understand past environments. Some animals only thrive in certain ecological conditions, such as upland grasslands or streamside woodlands. Groups of animal bones from the same archaeological context allow archaeologists to infer about paleo-environmental conditions during the time period when those deposits were formed. For example, let’s consider the presence of both jackrabbits and swamp rabbits in the same strata in archaeological sites along the southern edge of the Edwards Plateau. These fragments point to prey being targeted in both dry and moist environmental niches by prehistoric hunters and gatherers. Let’s go back to the saga of my post-retirement research. Following Steve Black’s invitation, I joined the ASWT project’s collaborative team. The ASWT project team is researching sites in Eagle Nest Canyon near Langtry in the western Lower Pecos cultural region. Incorporating the Eagle Nest Canyon data sets from the Eagle Cave, Skiles Shelter, and Kelley Cave collections allows them to be compared with that from Arenosa Shelter. Eagle Nest Canyon joins the Rio Grande about 15 miles west of Arenosa Shelter’s location on the Pecos River near its confluence with the Rio Grande. The Ancient Southwest Texas Project study allows me to link my Arenosa Shelter research to the ongoing Eagle Nest Canyon efforts. The linkage expands our understanding of life-ways in the western Lower Pecos cultural region and elsewhere in Texas. Analytical comparisons between Arenosa Shelter and the Eagle Nest Canyon sites have been focusing on Late Archaic and Late Prehistoric bone technology and subsistence economies. Most Eagle Nest Canyon sites lack the deeply stratified deposits present in Arenosa Shelter. In my view, this distinction is moot. As shown by my earlier Arenosa Shelter study, sixty per cent of faunal materials and bone artifacts were found in upper deposits (strata 4 – 9) with a Terminal Late Archaic context dating between about 2,300 and 1,300 years ago. Late Archaic and Late Prehistoric faunal materials had good to excellent bone preservation, as did those in Paleoindian deposits. Arenosa Shelter’s Middle and Early Archaic deposits (strata 12 – 36) were heavily damaged by high energy Pecos River flooding. Most of the bone fragments that these deposits may have originally contained were removed, especially those from smaller animals. Remaining bone in these strata also quite often has been redeposited in secondary context. Faunal analysis utilizes techniques I’ve applied over the past 20 years. Using standard zooarchaeo­logical procedures, skeletal materials from reference specimens of fish, birds, and mammals were used to identify the archaeological faunal material, assigning it to the most appropriate taxonomic group. Some of the reference specimens were loaned from the UT-Austin Jackson School of Geoscience’s Vertebrate Paleontology Laboratory. Assignment of bone fragments to the most appropriate taxonomic group requires an understanding of bone structure and skeletal anatomy of all potential animal groups, from fish and reptiles to birds and mammals. Some of the bones are easy to identify, based on their structure and morphology. Distinctive features allow identification of bone fragments to specific animal form and portion of skeletal element. For example, the archaeological and reference specimen bones in Figure 3 are both identifiable as feet bones from species in the rabbit family. 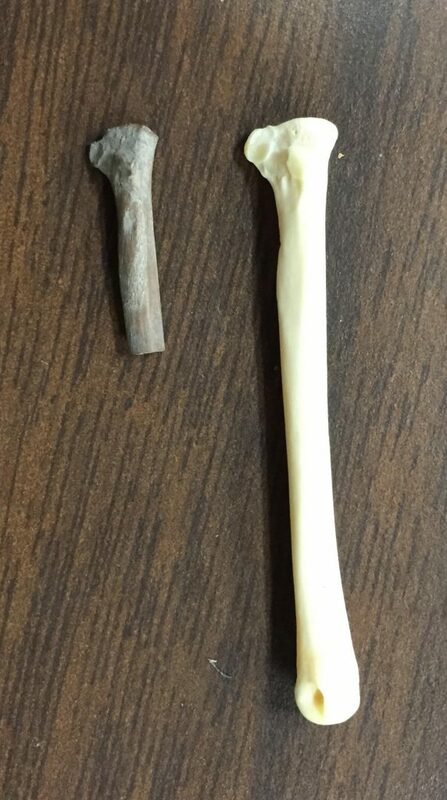 Figure 3: Comparison of archaeological specimen of cottontail rabbit foot bone and modern jackrabbit specimen from Jurgens reference collection. Microscopic examination of bone fragments is used to verify taxonomic and skeletal element assignment, especially for smaller animals. 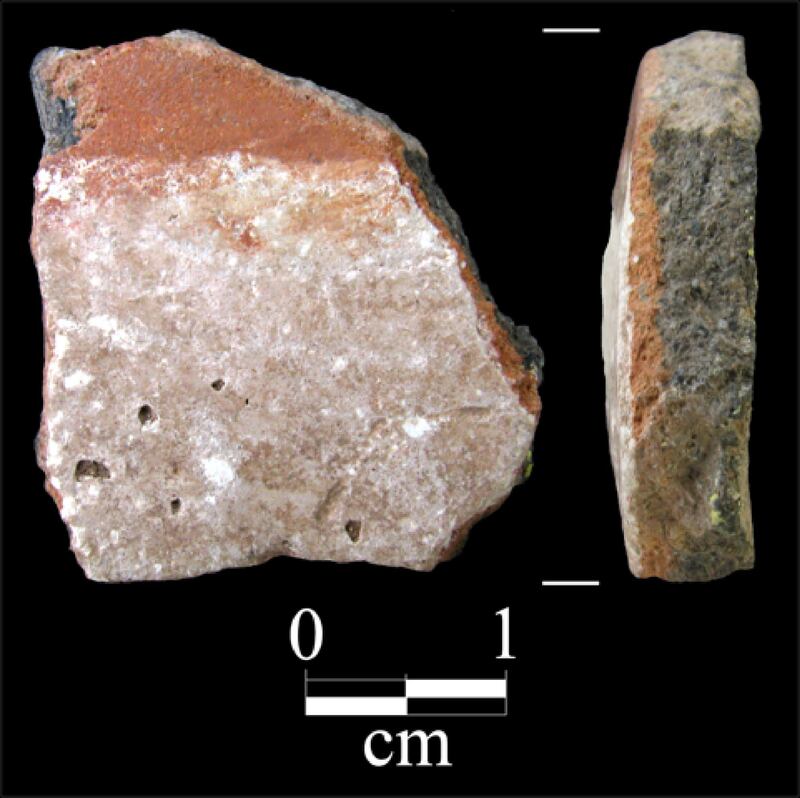 It is also used to search for cultural modifications that may be present on fragments. Microscopic examination uses a 10x-25x binocular microscope (Figure 4). Specialized lighting includes an overhead general light and a low sidelight low that increases contrast (Figure 5). The sidelight reveals changes to the bone surface. Butchering damage and technological modifications made during tool or ornament manufacture and use each leave distinctive traces on the surface of bone. The human modification may be the form of cut and chop marks, scrape marks, grinding, surface polish, and microscopic striations from use-wear. Carnivore damage and root-etching also modify the bone surface. 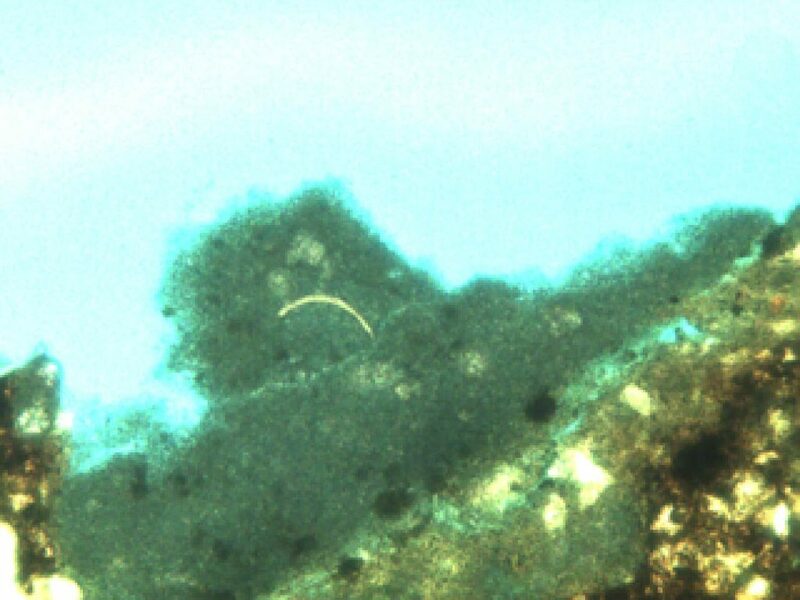 Figure 4: Bone fragments being examined microscopically during faunal analysis. Figure 5: Specialized lighting used during microscopic examination of faunal materials. The fauna from Eagle Nest Canyon sites parallel those from Arenosa Shelter. They appear to contain very similar faunal remains, including those of small to large mammals, fish, birds, turtles, and other reptiles. Bone preservation is variable in both locales, dependent on site formation processes and post-deposition effects of moisture on bone within the strata. The moisture present is from groundwater exiting from bedrock seeps or is from rainwater funneled from the canyon rims above the sites. Many bone fragments showed signs of butchering or cooking by the site’s inhabitants. Skinning and butchering leave distinctive cutmarks, as does dynamic bone breakage to remove marrow. 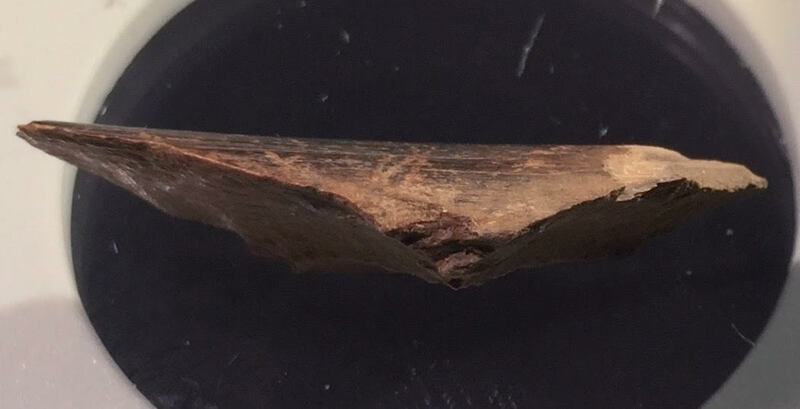 The bone flake from the Spring Lake site in Central Texas is a good example of a result from cultural activities to harvest bone marrow during butchering (Figure 6). Similar bone flakes are found in the Lower Pecos cultural region and elsewhere in Texas. Figure 6: Side view of bone flake from artiodactyl leg bone found during Spring Lake Data Recovery Project faunal analysis, with impact mark and fractures showing breakage for marrow harvesting. Some of the faunal remains and bone artifacts from the Eagle Nest Canyon sites have been burned, mirroring those in Arenosa Shelter. Two patterns of burning are evident—roasting and disposal. Direct heat cooking, such as grilling or roasting, leaves distinctive discoloration of bone fragments where bone was not covered by meat during cooking. The disposal pattern of burning is hypothesized to represent burning of food remains or incorporation of remnant bone into earth oven fill. Sometimes, discard pattern bone has been burned so intensely that most organic matter is removed from the bone. Bones incinerated by heat over 850o F caused this condition termed calcination. Similar patterns are being documented in analysis of the fauna from the Spring Lake site. The Eagle Nest Canyon/Arenosa Shelter comparisons have allowed me a clearer understanding of the western Lower Pecos cultural region. 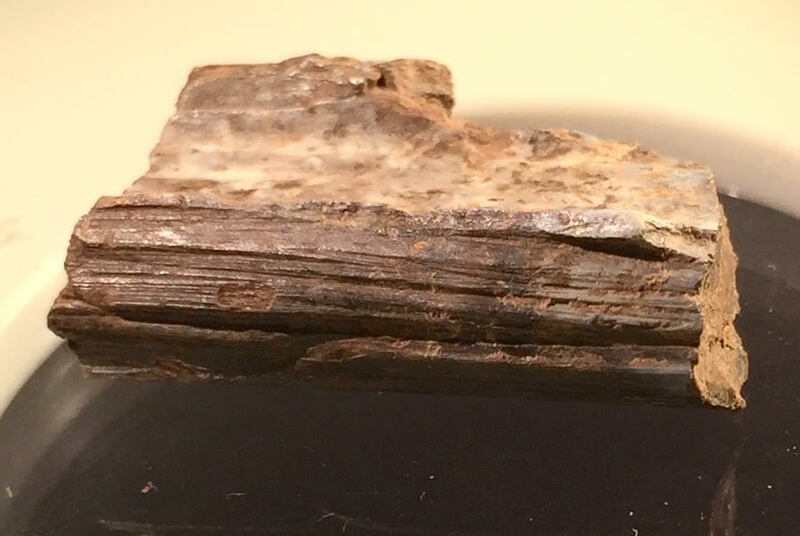 The concurrent analysis of the Spring Lake faunal material is extending that knowledge to the eastern edge of the Edwards Plateau. My research has documented 1) eco-niches targeted by the prehistoric inhabitants, 2) specific subsistence behaviors (e.g. filleting of fish, specific cuts to overcome defensive pectoral fin spines in catfish, and specialized skinning of mammalian carnivores), and 3) manufacturing and use of tools or ornaments from boney subsistence remnants. A wide variety of formal bone tool and ornament types have been recorded, as have the manufacturing processes for them. Evidence of manufacturing processes included scrape marks made to remove the periosteum layer from the bone surface; distinctive grooves cut to facilitate controlled snapping of the bone into segments; scraping and grinding to shape tool or bead preforms; and wear left by contact with plant materials, hides, or other substances during use. 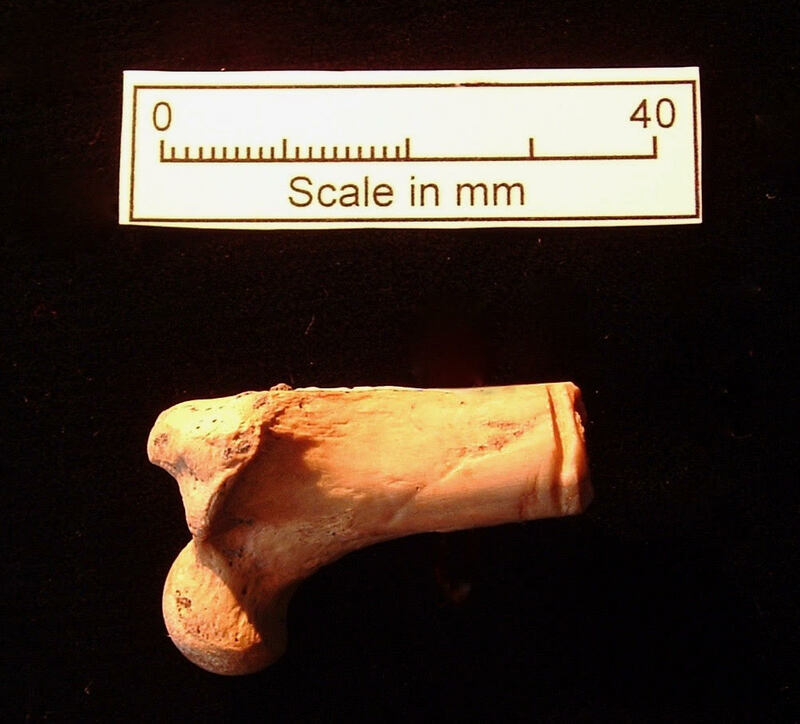 Most formal tools were made from deer lower leg bones (Figures 7-9). Other skeletal elements of deer were also used to manufacture formal tools, such as the ulna or antler times (Figure 10). 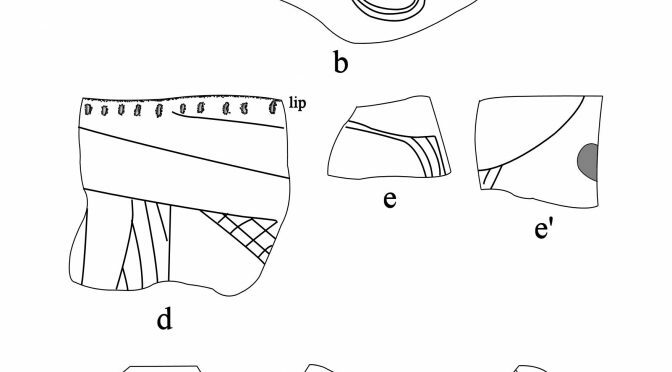 In addition, bones of smaller mammals formed the raw material for tool manufacture, as did the pectoral fin spines of catfish (Figure 11). Informal expediency tools are rare, but manufactured from large mammal long bones during butchering and retain use-wear from meat, sinew, or hide (Figures 12 and 13). Figure 7: Arenosa Shelter (41VV99) spatulate tool manufactured from deer lower leg bone. Figure 8: Bone tool fragment from Spring Lake Data Recovery Project faunal analysis showing grooving used to detach tool blank from deer or antelope long bone. 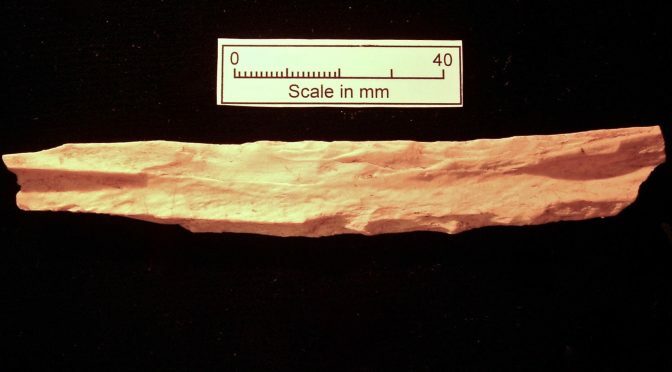 Figure 9: Fragment of Early Archaic bone tool from Spring Lake Data Recovery Project with manufacturing evidence and use-wear from silica-rich plants. 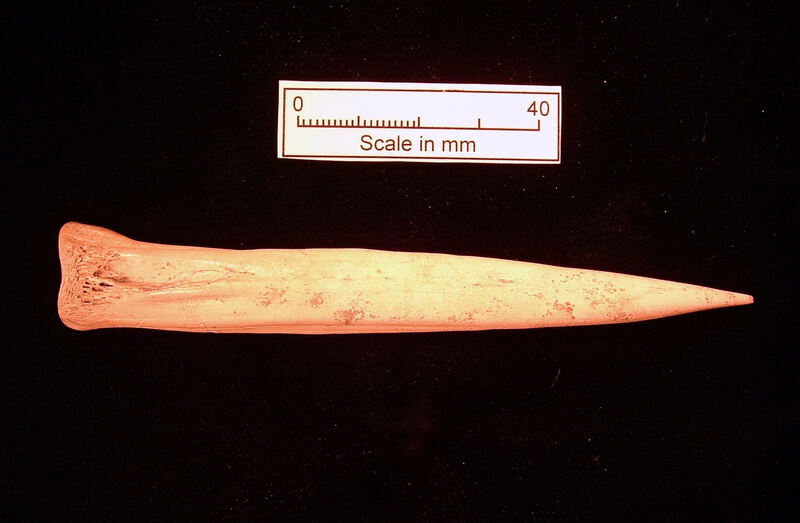 Figure 10: Deer ulna spatulate tool from Arenosa Shelter (41VV99). 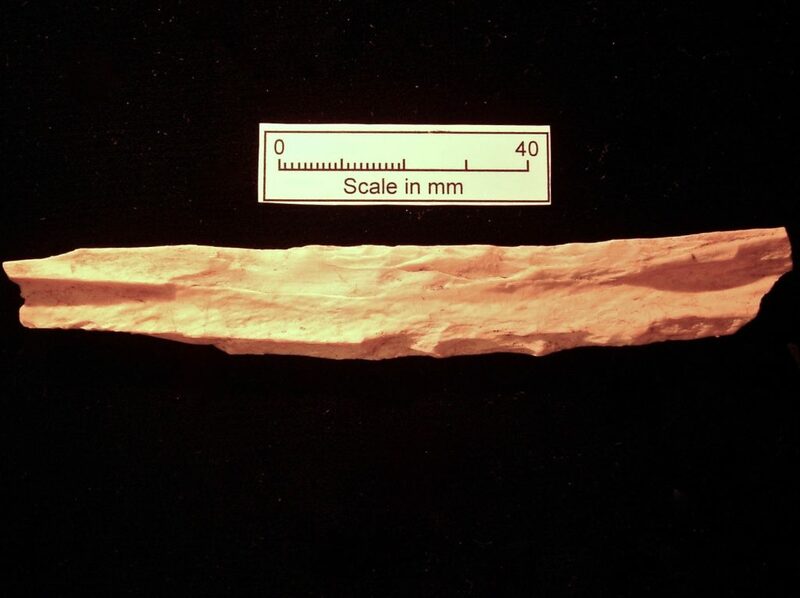 Figure 11: Catfish pectoral spine tool from Arenosa Shelter (41VV99). Figure 12: Bone expediency tool from Arenosa Shelter (41VV99). 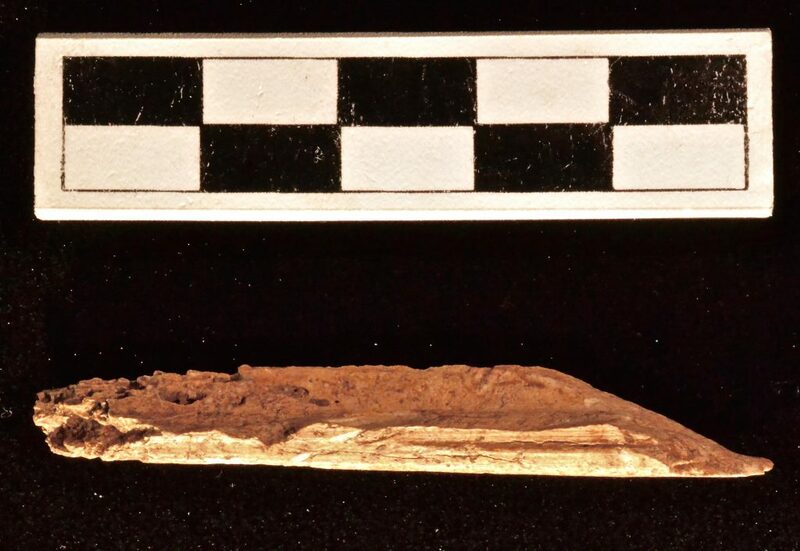 Figure 13: Fragment of informal bone tool from Spring Lake Data Recovery Project with grooving used to detach tool blank from long bone. Narrow end has use wear from hide working. In my research, I have adopted a bone tool typology based on tool morphology, supplemented with use-wear analyses to document the actual function. Many bone tools from the Lower Pecos cultural region have been mistermed “awls” in the literature, implying function based on the tool form. The morphology of these tool’s cross-section is generally flat and ovoid. 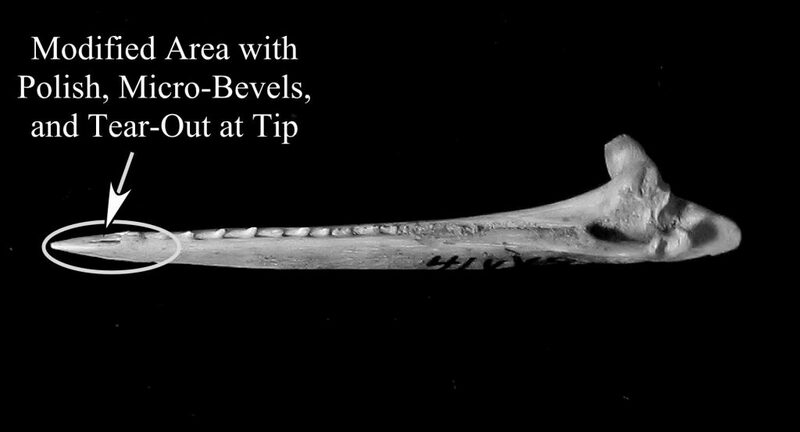 The main differences are in the tip (distal) section. Measurements of width and thickness at and near the tip are used to assign the tools into types. Use-wear analysis is then conducted to determine actual function. Use-wear studies revealed that those tools were used by prehistoric inhabitants to extract other resources from the environment or to manipulate them. Hides, desert succulent fibers, meat, wood—wear from all of these were revealed on tools or tool fragments through microscopic examination. 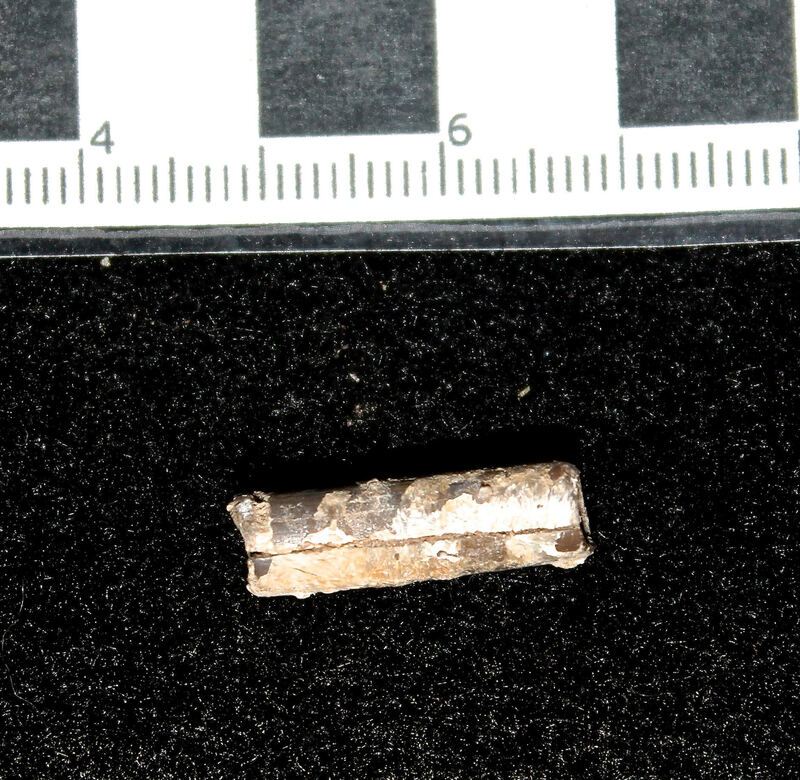 Figure 14: Bone bead from Eagle Nest Canyon sites in Lower Pecos. Beads were manufactured from bird or small-medium mammal long bones, with hawk and rabbits being the most common source animals (Figure 14). A Eureka! moment in my research came when I recognized that long bone ends from these animals retained evidence of being cut off during bead manufacture. Linking bead cross-section to morphology of the cut-off bone ends allowed identification of species that were the most common source animals (Figure 15). 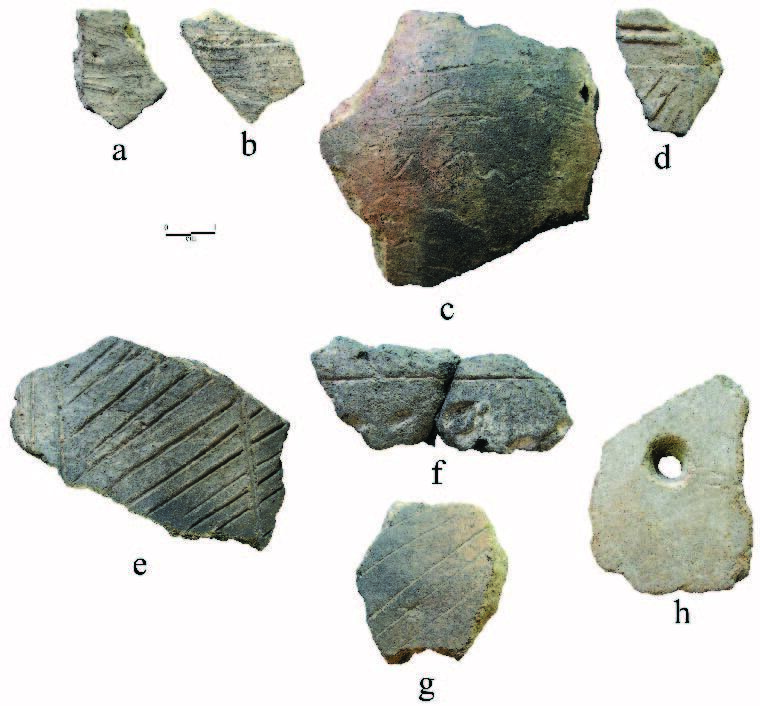 Figure 15: Bone bead manufacturing debris from Arenosa Shelter (41VV99). During the on-going Spring Lake Site faunal analysis, I’ve noticed many parallels to the Lower Pecos study results, especially in the presence of bone technology remnants. The Spring Lake site shows that the same processes used to make the tools and ornaments in the Lower Pecos were in use in Central Texas by the Early Archaic. 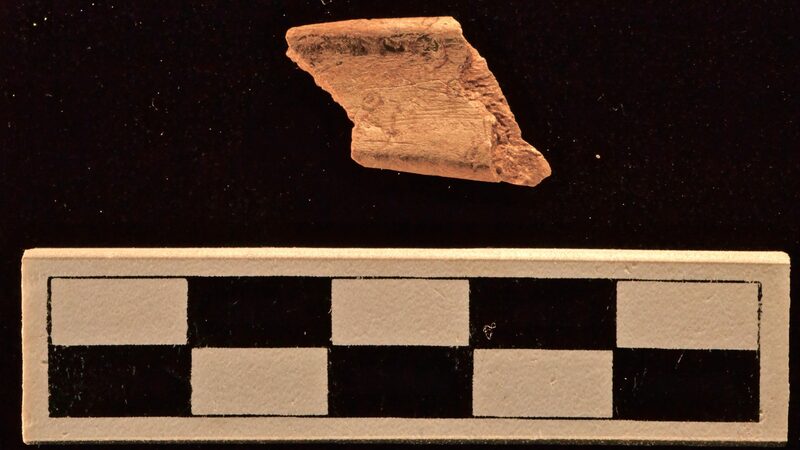 One problem that I’ve come to face in the Spring Lake site study is that bone tool or ornament fragments, and evidence for their manufacture, have rarely been recognized or documented in Central Texas. Part of that scarcity is due to the differences in site types between the Lower Pecos and Central Texas. Fewer dry rockshelters are present in Central Texas. Bone preservation in the clay soils of Central Texas is another problem. Mechanical crushing is caused by movement in the region’s expansive clay soils. Overall bone fragment size of archaeological faunal remains in Central Texas is much smaller than in the Lower Pecos. A separate problem is the lack of trained zooarchaeological specialists. This problem can be addressed by appropriate interdisciplinary education in university archaeological programs. I was fortunate during my undergraduate and graduate education to be trained by paleontologists and zooarchaeologists. These dedicated educators continue to mentor me even near the end of their careers or in retirement. Following their examples, I am mentoring the current generation of students. 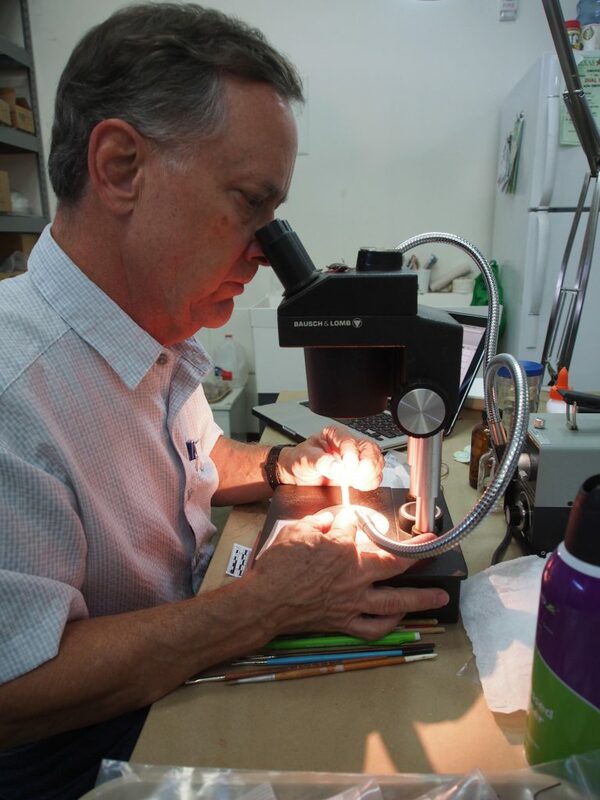 Training in zooarchaeological methods is no different than training in lithic or ceramic analytical methods. Unless students are taught the methods, how can they identify animals represented in archaeological sites, much less recognize the signals of bone technology amongst the subsistence debris? Sites such as Arenosa Shelter, the Eagle Nest Canyon sites, and the Spring Lake site help us open doors onto the past. Once we throw those doors open, we can begin to understand how prevalent and widespread cultural processes, such as bone technology, were in prehistory across Texas. Ezekiel’s right: we archaeologists must open our eyes and minds to the dry bones that help us understand the remnants of prehistoric cultures that surround us. 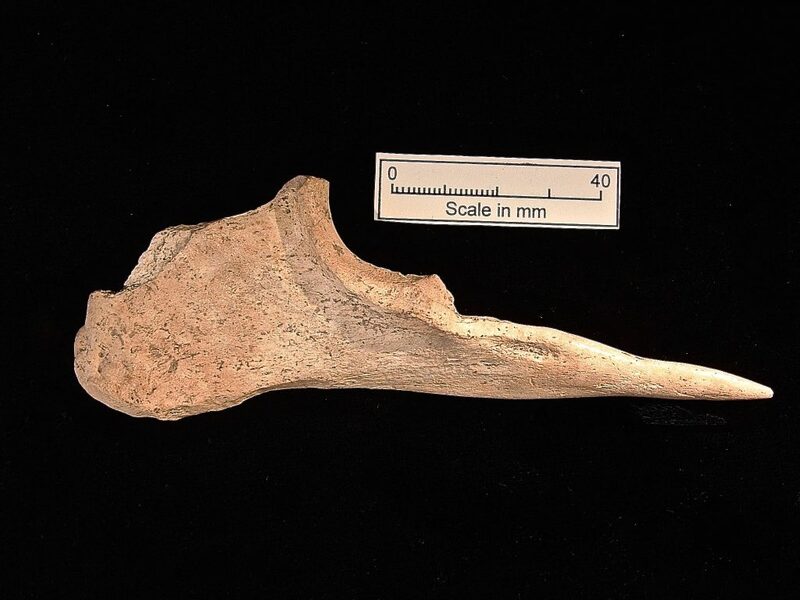 2005 “Zooarcheology and Bone Technology from Arenosa Shelter (41VV99), Lower Pecos Region, Texas.” (http://repositories.lib.utexas.edu/handle/2152/1586). Unpublished Ph.D. Dissertation. Department of Anthropology. The University of Texas at Austin. David Glen Robinson is an Affiliated Researcher with the Texas Archeological Research Lab. This article is part of the December 2017 issue of the TARL Newsletter. An unusual painted potsherd was unearthed in the 1938-1939 WPA excavations of the Hatchel Mound in Bowie County, Northeast Texas (Perttula 2014). The sherd was part of a large lot of ceramics and only recently came to the notice of analysts. Painted ceramics of any type are rare in the Caddo region, and so detailed studies of the sherd were conducted to learn, if possible, about its origins, technology and functions. The zone in the mound from which the sherd came is estimated to date to the early 16th century A.D. The small specimen measures 24 X 23 mm, making typological assessment very difficult. A wide literature search was conducted to find similar or matching stylistic types. The closest approach to a similar type was Nodena Red and White, widely but not abundantly distributed from parts of northeast Texas through Louisiana and parts of Mississippi. That type is tempered with shell, while the Hatchel Mound sherd has quartz temper, so some uncertainty remains with the typological assessment. 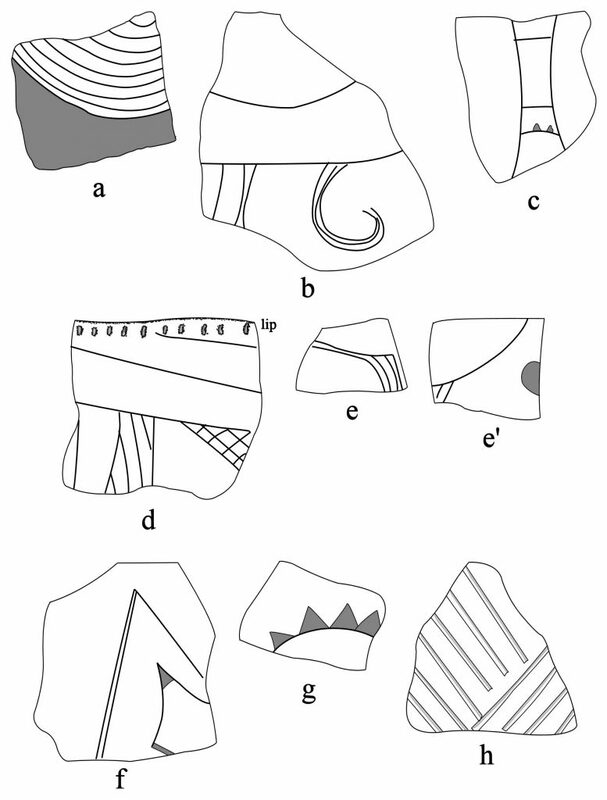 Avenue Polychrome was also mentioned, but that type has even more tenuous connections to the Hatchel sherd. The sherd has a layered look in megascopic view, its interior layer a gray tempered paste gradually transitioning to a red-brown paste color on the exterior surface. The difference in colors and the gradual transition from dark to light on the same kind of paste suggest skilled control of firing atmospheres to produce the differences. A white or pinkish white paint layer sits conformably on the reddish exterior paste. The paint is made of either finely ground shell or a slurry of refined clay with admixed crushed shell. Microphotographs of the paint layer in thin section reveal an arcuate bit of shell and circular, silt-sized masses within the paint layer. All these bodies have calcitic traits that indicate shell material (non-fossilized). 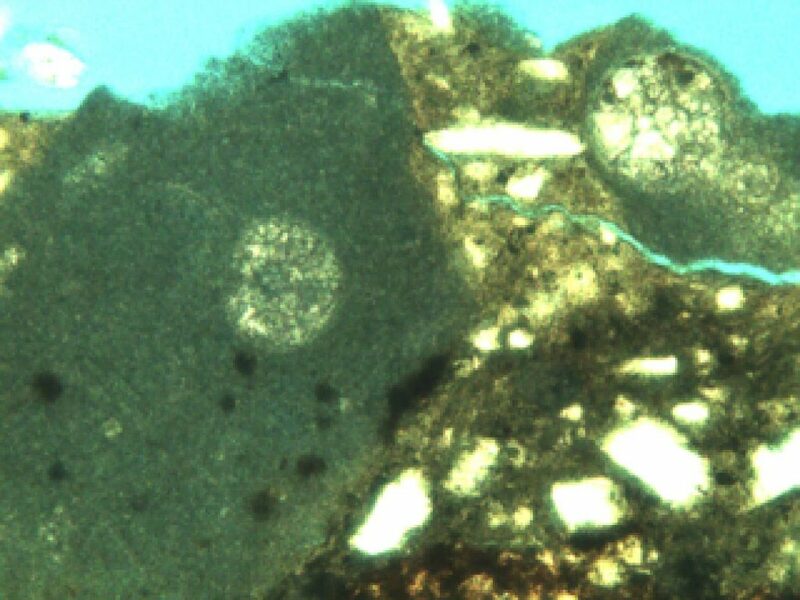 Microphotograph of the paste in thin section. Note the gradual transition from dark at the bottom to lighter at the upper left. shell structures incompletely ground. Paint is pinkish white in normal light, gray-green in plane-polarized light, as here. Paint mass with arcuate shell fragment. Note other dim calcitic particles in the paint. 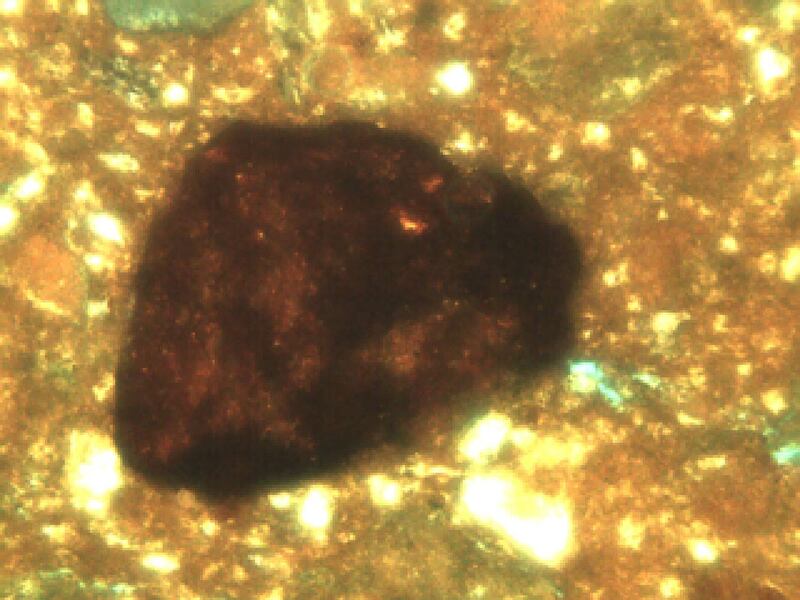 Fine black particles are hematite pulled up from the underlying paste. 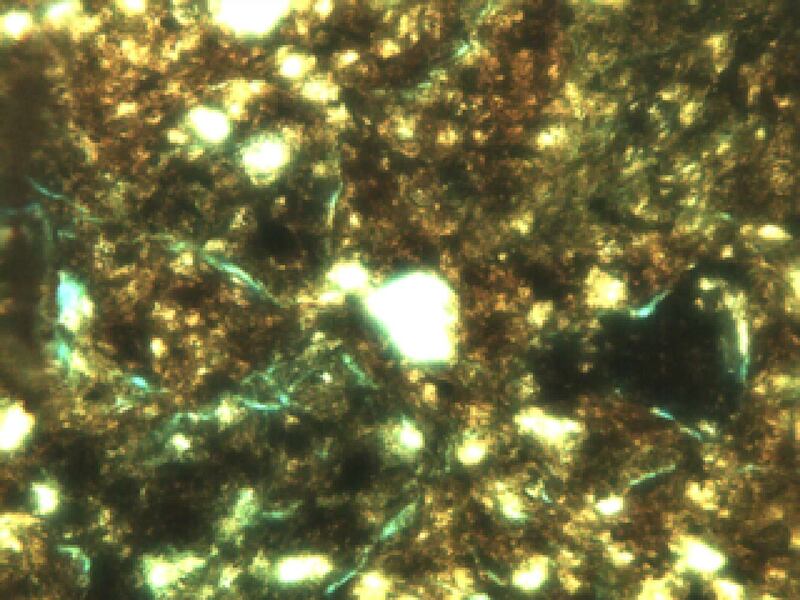 Medium sand-sized particle of magnetite in the paste, in reflected light view. Altogether, this ceramic piece retains some mystery even after microscopic analysis. It certainly reveals, however, the fact that it was an exceptionally well-made pottery piece in the Caddo tradition, and when whole it was a prized and attractive ceramic vessel. Dr. Timothy K. Perttula was the principal investigator of the Hatchel Mound studies that produced the unusual bichrome sherd from lot #1296. His facilitation of the project is greatly appreciated. Dr. George Sabo conducted some of the typological survey that homed in on Nodena Red and White. The microscopic work was conducted at Texas Archeological Research Laboratory, The University of Texas at Austin. The staff is thanked very much for their assistance. Northeast Texas Archaeology, Austin and Pittsburg. Dan Prikryl is an Affiliated Researcher with the Texas Archeological Research Lab. This article is part of the December 2017 issue of the TARL Newsletter. In the December 2016 issue of the TARL newsletter, I provided general background information on Works Progress Administration (WPA)-era excavations at the Rob Roy Site, 41TV41, which is located on Lake Austin in western Travis County, Texas. My work on these materials has continued with my most recent analysis focusing on the 21 deeply buried burned rock features that are present within a previously unrecognized Late Archaic I Period component as defined by Johnson (1995:73, 89-98). One of the most interesting aspects of the analysis of these features concerns an obvious cluster of seven individual burned rock features that together form a large irregular circle. 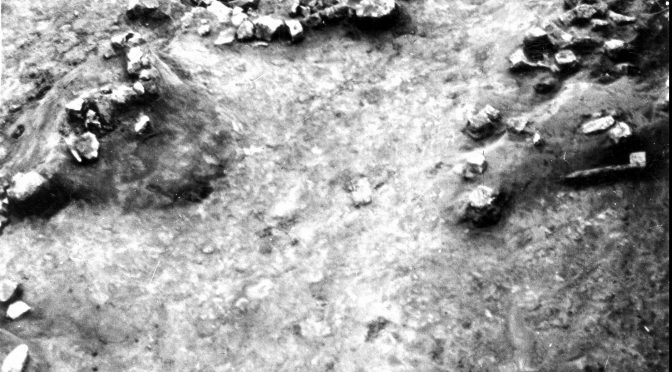 The University of Texas archaeologists who led the field project recognized this cluster, but they provided no interpretation (Woolsey and Oberg 1939:53). This cluster consists of Feature #26, a 1.7-meter (m) diameter, well-defined, basin-shaped circular hearth/earth oven, and six surrounding satellite burned rock features. A circular, 60 to 120 cm wide area that is mostly void of burned rocks exists between the outer edges of Feature #26 and the inner edges of the six satellite features (Figure #1). None of the six satellites are basin-shaped. Instead, they consist of one flat, dense continuous burned rock pavement (Feature 29), four flat, amorphous burned rock groupings (Features #24, 25, 28 and 30), and one somewhat circular burned rock heap (Feature #27). Several of the satellites cover quite large areas including Feature #28 which measures 3.00 x 1.11 m and Feature #29 which covers an area measuring at least 2.76 x 1.62 m.
Overall, the irregular circle formed by the seven features extends 5.97 m on an east-west line. The total length on a north-south line is unknown because two of the satellites (Features #27 and 29) continue into an unexcavated area. The exposed part on a north-south line covers a length of 3.05 m.
Figure 1. View of Portion of Feature Cluster: Note Central Hearth/Earth Oven Surrounded by Area Generally Void of Burned Rocks. Several Satellite Features are Visible Beyond the Void Area. Marshall point that was found between Features #28 and 30 at an elevation about 15 cm above these features. The irregular circle is like some other feature patterns reported at sites in Central and West Texas that have either been as interpreted as aboriginal structures (Lintz et al. 1995; Johnson 1997) or as incipient burned rock middens (Luke 1983; Hixson 2014). All together, these feature patterns include examples that have been dated to the Early Archaic, Middle Archaic, Late Prehistoric Austin Phase, and Historic Indian periods. Aside from one hollow area in one of the satellite features, there are no other apparent rock-free spaces within any of the other satellite features that would have been left by wooden posts to support the walls of a structure. 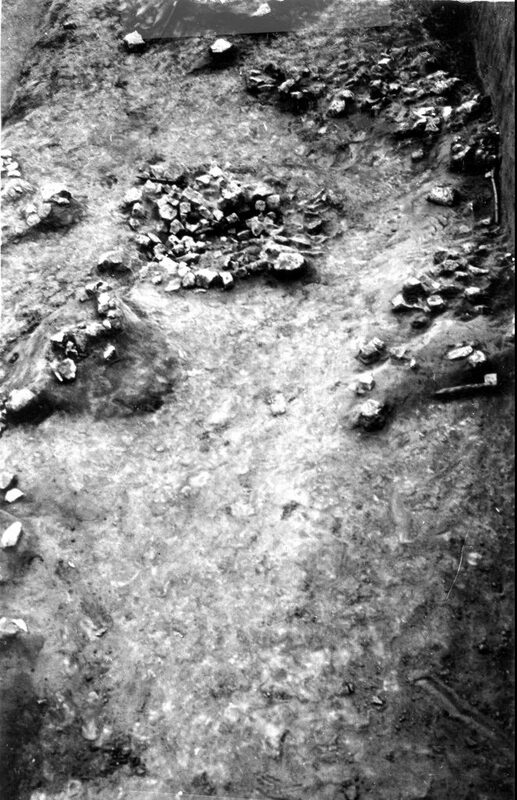 Given the overall nature, sizes and shapes of satellite features, especially Features #27-29, the cluster of features more closely resembles an incipient burned rock midden. Hixson (2014) has provided a thorough discussion of the incipient burned rock midden model in which he proposes that these circular features consist of a central earth oven surrounded by satellite clusters of burned rocks that represent earth oven clean-out material resulting from repeated use of the central feature. Hixson (ibid) states that the generally 60 to 120 cm wide circular, vacant space that exists between the central feature and the satellite rock clusters could either be the workspace for the aboriginal people using the central cooking feature or could represent the eroded remains of a former circular berm of stockpiled dirt used in association with earth oven cooking. Since the Rob Roy Site is situated on an alluvial terrace, it is probable that the incipient burned rock midden was buried during a flood event before continued use would have led to the development of a denser, mounded burned rock midden. Hixson, C. A. 2014 A New Hypothesis to Explain the Large Burned Rock Features with Satellite Clusters. In A Cultural Resource Reconnaissance Survey of Select Portions of the Lake Buchanan Shoreline Exposed by Recent Droughts, Burnet and Llano Counties, Texas by C. A. Hixson, D. J. Prikryl, and A. F. Malof. Lower Colorado River Authority, Austin. Johnson, L. 1995 Past Cultures and Climates at Jonas Terrace, 41ME29, Medina County, Texas. Office of The State Archeologist Report 40. Texas Department of Transportation and Texas Historical Commission, Austin. 1997 The Lions Creek Site (41BT105): Aboriginal Houses and Other Remains at a Prehistoric Rancheria in the Texas Hill Country (Burnet County). Archeology Studies Program, Report 1, Environmental Affairs Division, Texas Department of Transportation; Report 41, Office of the State Archeologist. Texas Historical Commission, Austin. Lintz, C., A. Treece, and F. Oglesby1995 The Early Archaic Structure at the Turkey Bend Ranch Site (41CC112), Concho County, Texas. In Advances in Texas Archeology, Contributions from Cultural Resource Management, edited by J. E. Bruseth and T. K. Perttula. Cultural Resource Management Report 5. Texas Historical Commission, Austin. Luke, C. J. 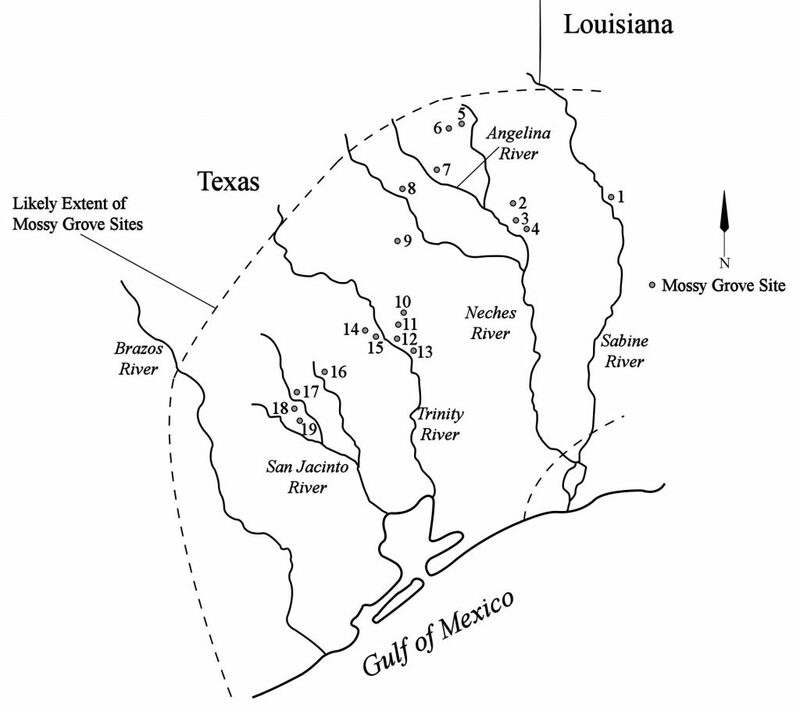 1983 The Musk Hog Canyon Project, Crockett County, Texas. Publications in Archaeology, Report No. 24. State Department of Highways and Public Transportation, Austin. Woolsey, A. M. and K. Oberg 1939 Field Notes, Site 1, Miller Lake, Burnt Hollow, Roy Ranch. WPA Archeological Project Sponsored by the Anthropology Department, The University of Texas, Austin. The publications and manuscripts housed at TARL are a great resource for all types of researchers. 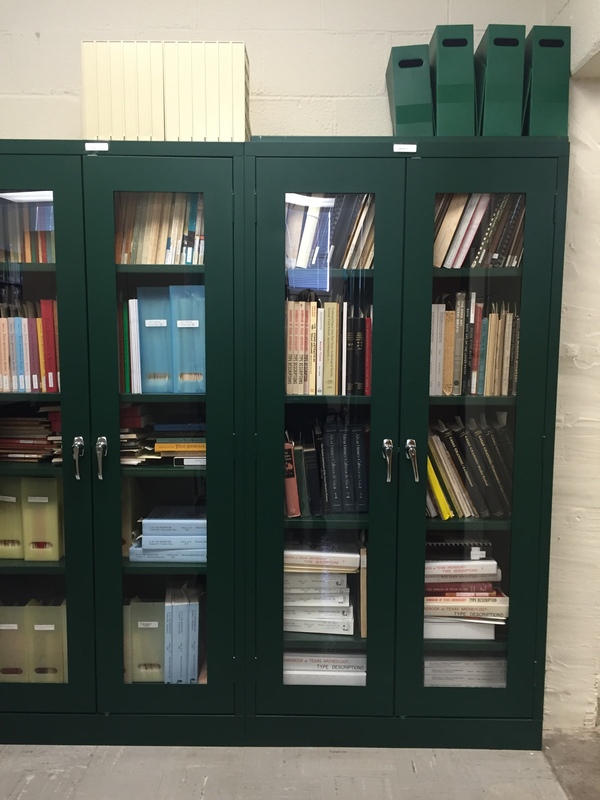 The TARL library is one of the Texas Historical Commission’s repositories for cultural resource management reports completed under an Antiquities Permit. At TARL, reports and manuscripts are for in-house use only from Monday through Friday, 8AM to 5PM. Please call or email before you come to use the library at TARL, so that staff may better help you. There is no fee for library use. 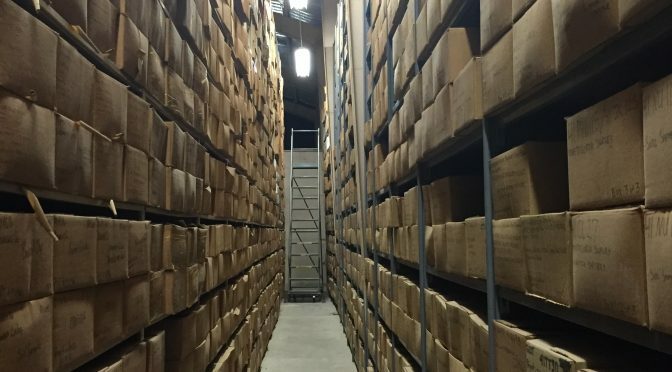 Many of the older reports and manuscripts held by TARL are difficult to locate elsewhere, but are available at TARL to researchers once they have been vetted by TARL staff. Although the library collections’ focus is Texas Archeology, a somewhat more limited collection of archeological reports from other areas of North America is available. Examples of older Texas manuscripts and reports in the TARL library are those by George C. Martin, Edwin B. Sayles, James E. Pearce, Arthur M. Woolsey, and Alvin T. Jackson. 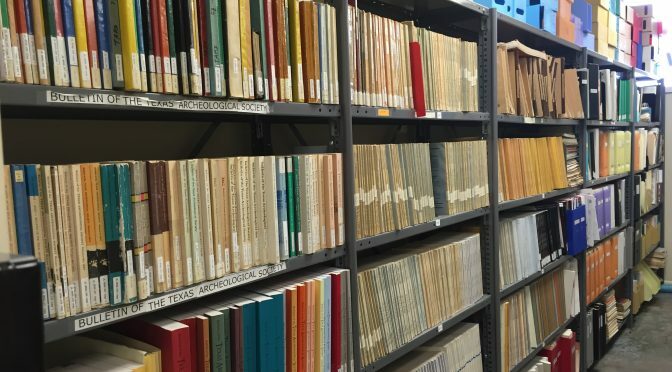 TARL holds archeologically-related thesis and dissertations dating as far back as 1919; most but not all of these are from The University of Texas at Austin. TARL’s library collections has many of the early reports from universities, museums, state and federal agencies, archeological contracting firms, and archeological societies as well as several archeological and anthropological journal series. The library houses reference materials concerning archeological field and laboratory methodology, historic architecture, biology, geology, and geography. Several of the older Texas Archeological Survey (TASP/TAS) and TARL reports are still available to be purchased and some reports have been scanned. The scanning of these reports is a continuing process and reports are scanned by TARL staff as time permits. Please check with the staff about the reports available if you need a report from one of these series. Rare books in TARL’s library collection. 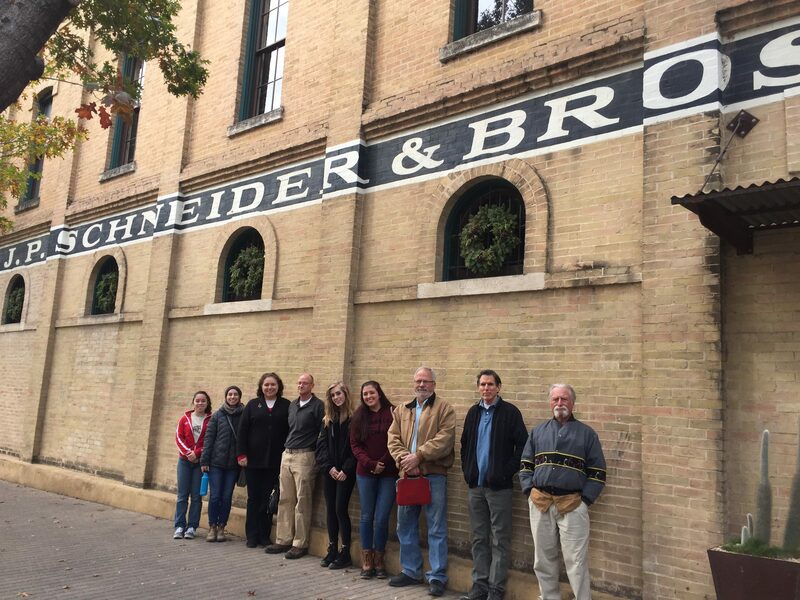 This month, TARL students, donors, and volunteers had a chance to visit downtown Austin and see the historic buildings and excavation areas uncovered during excavations of Austin’s Guy Town district in the 1990s. TARL Associate Director Jonathan Jarvis led the tour and talked about his experiences working on this project and the challenges of doing archeology in an urban environment. The massive archeological project covered four city blocks under what is now Austin’s City Hall and Second Street district–a part of town that in the 1870s–1910s was full of boarding houses, brothels, saloons, and gambling halls mixed in with the homes of working-class families and everyday business ventures. The tour group started the day with a look at some of the many artifacts recovered by archeologists, which included telltale signs of the lively atmosphere–beer and liquor bottles, poker chips, and dice–as well as the items lost or left behind in the course of everyday activities, such as sewing needles, children’s toys, and dishes. The artifacts recovered by this project are curated at TARL. 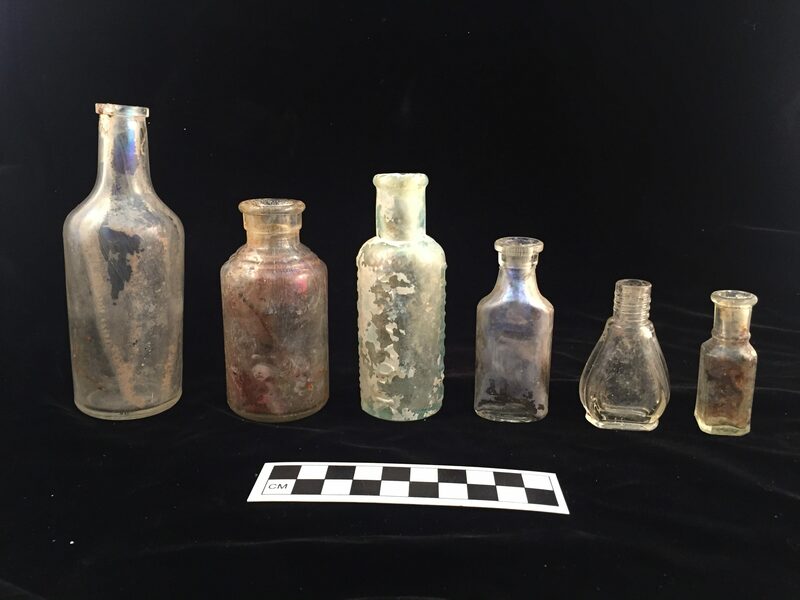 A huge number and variety of glass bottles were recovered from the Guytown excavations, including many beer and liquor bottles, patent medicine bottles, and perfume bottles. We then visited the downtown site, where we learned a bit about the geomorphology of the Colorado River and the terrace where downtown Austin sits. Finally, we got to check out the few remaining historic structures in the area. 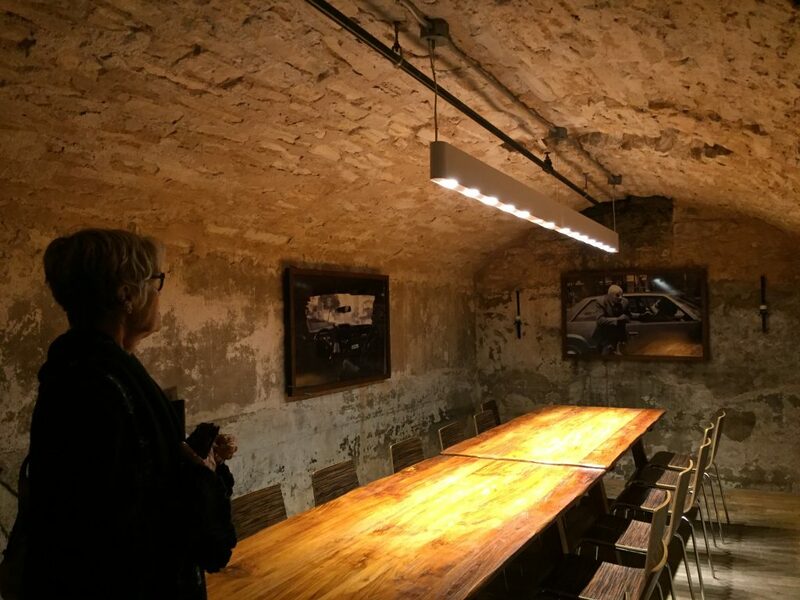 A highlight of the field trip was a visit to the Schneider Beer Vaults, built by German immigrant J.P. Schneider, who dreamed of starting a brewery. The historic building across the street was also owned by the Schneider family and operated as a general store. We also learned a bit about another downtown historic site, the Susanna Dickinson Hannig House, where Alamo survivor Susanna Dickinson lived out her last days. The Dickinson-Hannig House was also excavated during downtown construction in the 1990s, and is now a small museum near the Austin Convention Center. TARL students, staff, volunteers, and friends in front of the J.P. Schneider General Store building in downtown Austin. One of the barrel-vaulted underground chambers built by the Schneider family sometime in the 1870s. The structure is in the style of “beer vaults” built by many German immigrants, but Schneider died before it was ever used for brewing beer. The structure was re-discovered by archeologists in the 1990s. 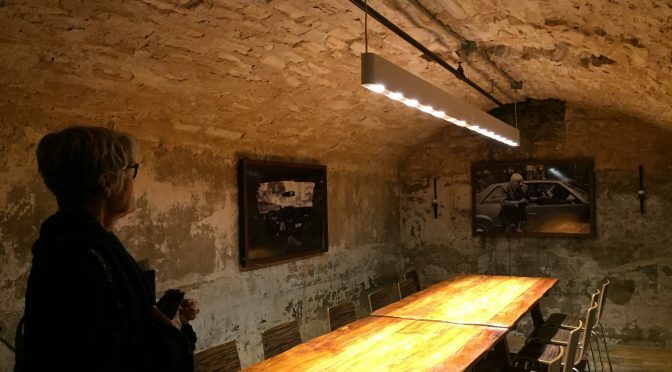 Special thanks to Josh Prewitt, General Manager of La Condesa, and the La Condesa staff for welcoming us into their space so we could see the underground beer vaults, a unique gem of Austin’s history. Field trips like this one are a special perk of membership in the Friends of TARL! Join the Friends of TARL to receive invitations to special events in 2018. TARL is excited to announce that our long-awaited improvements to our largest artifact storage area are getting underway this month. This construction project will provide increased security for our collections, as well as greatly improved climate control and work space. Our artifact collections will be fully accessible throughout the construction project timeline (December 2017 through April 2018). If you’re planning to conduct research using TARL collections during this time, please give us several weeks of additional lead time to pull artifacts, as we might have to work around the construction crews. This project will have no effect on other TARL services, such as trinomial requests, file searches, new accessions, or research in the TARL records. If you’re planning to visit TARL for research purposes between now and April, please send in your request for collections access early. We look forward to seeing you!